The objectives of this subcomponent are the followings. to analyze and understand human-nature interactions related to grazing in alpine, temperate, and subtropical areas. The former information will be used to recommend measures for climate change adaptation and methods for monitoring climate change impacts, and the latter to propose a model for participatory management of grazing. The study of impacts of climate change in the Himalayan ecosystem is required in terms of understanding the change of the ecosystem. According to the academic research conducted recently, it is reported that the glaciers in Sikkim get thicker than before despite the effects of the climate change. Moreover, ecosystem as well as glaciers is considered to be affected by the climate change, and the extent of the effects is not clear at this moment. In order to prevent the future deterioration of the alpine ecosystem due to the land slide and change of the water flow by the climate change, this study is needed. In addition, study of impacts of grazing in the Himalayan ecosystem will be also beneficial. Currently, although the grazing is basically not allowed in Sikkim, local people consider grazing as one of the important income generating activities. In this connection, the result of this study will be the basis for policy discussions how much grazing could be allowed in the alpine area. A set of climatological equipment will be procured for data generation and analysis. Traditionally, grazing is an important animal husbandry practice in all parts of Sikkim. Though grazing has been banned in the state, it has continued to a lesser extent in certain places such as the alpine areas in North Sikkim. The status of grazing in any given location affects its ecosystem and biodiversity; thus grazing must be managed explicitly to conserve them. In addition, ecosystems are presumably being modified by the recent global warming phenomenon. The changes in progress, particularly in high-altitude areas, need to be understood and predicted accurately for the effective management of forest and biodiversity resources. 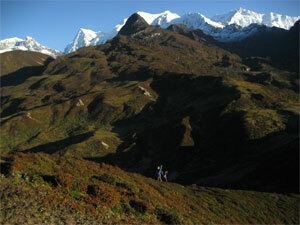 Ecological survey will be carried out in collaboration with the Sikkim University and other competent institutions. The ecological study will be expected to examine the impacts of the climate change particularly on the change of the eco-system. Adaptation processes of the Himalayan ecosystem to the changing climate will also be studied by selecting several indicator species. The study will produce recommendations on adaptive forest and biodiversity management and on appropriate monitoring and evaluation methodologies. The details of the study will be examined during the implementation of the Project. Because grazing on public lands is a sensitive issue among stakeholders, establishment of rapport with local communities is a prerequisite for conducting this study. Therefore, this study will begin with interactive meetings with local stakeholders to share with them the objectives of the study and to secure their cooperation. This study will examine the dynamic relationships between the number of grazing animals and their productivity, and between the natural conditions of grazing grounds and the composition of floral and faunal species and their biomass. The assumptions and hypotheses to be tested will be determined prior to the commencement of the study. Relationships between socioeconomic variables, based on information obtained from grazing operators/herders, and variables on floral and faunal conditions of areas subject to grazing will be analyzed. The outputs include the following: documentation of change in the social and livestock production system, the dynamics of floral and faunal composition of grazing areas and their and vicinities, and the relationship between changes in socioeconomic conditions and biodiversity. An assessment of overstocking will also be conducted. Three graduates from local educational institutions for three years will be engaged in the study in three to four locations. They will conduct the study under the supervision of their senior faculty and officials of the Forest Department.